Driving down a main road in Woodbridge, Connecticut, it’s easy to overlook an industrial white building set off the road and hidden behind a luxury car dealership. Inside that large nondescript manufacturing building exists one of the most influential and creative craft breweries in southern New England. As soon as you walk into New England Brewing Company's (NEBC) taproom you end up joining a party-like atmosphere. Even though you can’t buy a pint of beer, NEBC is like a carnival with classic rock blaring on a stereo and people hanging around trying some free samples and waiting for their growlers. The small taproom is currently being renovated, but to add some local charm the brewery invites vendors who bring homemade jerkies and hot sauces. One of the employees I’ve become familiar with seeing at NEBC is Craig Gilbert. Craig chats everyone up while loudly calling out the names of people waiting for their filled and ready-to-purchase growlers. Craig designed numerous product logos for NEBC including the logo for Gandhi-Bot and G-Bot. I asked him about his inspiration for the original can. He smirked and said “anything you turn into a robot is cooler than it was previously." This apparently applies to Gandhi as much as anything else. Having a little fun with the criticism while also changing the packaging, Craig decommissioned the original Gandhi robot in 2015 while keeping the can as similar as possible. The logo changed when New England ended up on the wrong end of a publicity battle. The free marketing provided due to the controversy unintentionally provided New England with a larger audience even though the beer had been around for several years before people started to complain about the name; a lousy beer would simply have be taken off the shelves but as people became more aware of it, requests came in ten-fold. The popularity of G-Bot came almost by accident. Originally introduced in 2011 (as ‘Gandhi-Bot’) it was the first double IPA canned in the state of Connecticut. Gandhi-Bot made it into the craft beer market without much fanfare, as an experimental brew using both Columbus and Simcoe hops. Sebastian d’Agostino, one of the current brewers at NEBC elaborated, “when it was introduced, no one really cared. Few people wanted big hop bombs at the time." Well, that’s certainly changed a bit in the last five years. 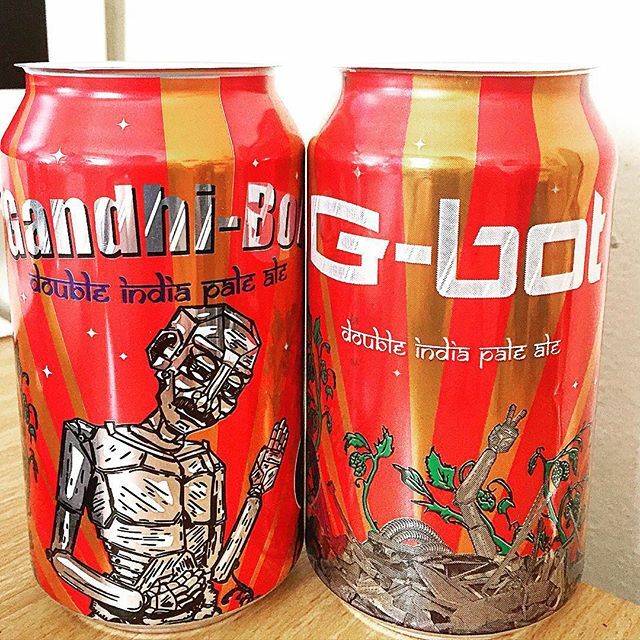 Gandhi-bot / G-Bot became more and more popular, particularly over the last five years when double IPAs and bitter, big-hopped beer gained momentum in the craft brewing community. G-Bot pours out a golden orangy color, with pillowy white head. The beer has some really big flavor; it is a bitter hop-forward imperial IPA with notes of fruit and resin. Despite the strong flavor, the aroma is more subtle. Take a sniff you get some citrus and pine notes. G-Bot has a pleasant bitterness, and for a beer with an 85 IBU, it does not have an overpowering taste of alcohol. The finish is more floral than citrus with a bitterness complemented with a taste of bready rye. G-Bot is one of the more difficult beers to acquire outside of southern Connecticut, but if you manage to get your hands on a can, it will not disappoint.